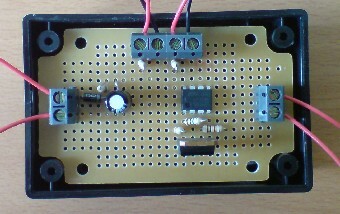 Buy of SOLAR PUMP CONTROLLER CIRCUIT. 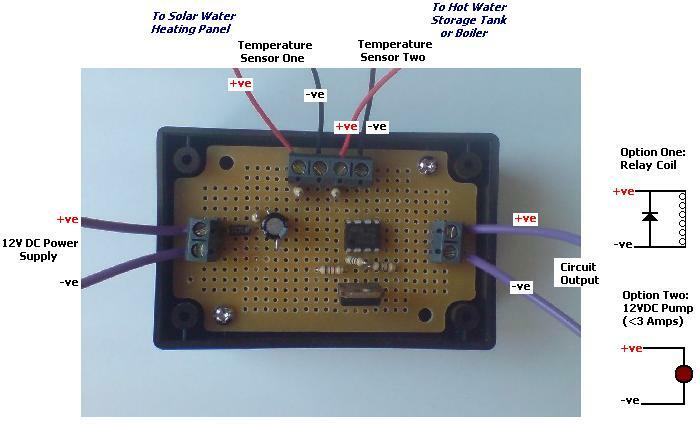 This circuit is used to electronically control the pump in a solar water heating system. Full details of the operation of this circuit are provided in our article Solar Water Heating Pump Controller. NEW We now have a mini functionally identical version of this controller available here: Differential Thermostat at a reduced price. 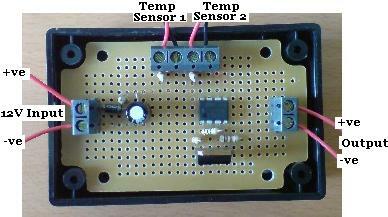 The two LM335Z Temperature Sensors are provided pre-soldered onto short 100mm leads. Additional lengths of red cable and black cable should be purchased if required to enable the temperature sensors to reach the solar water heating panel and to the hot water storage tank. Some 3A terminal strip is provided to make the necessary connections. The first temperature sensor should be stuck to the copper pipe as it leaves the heating panel, the second should be stuck to the outside of the hot water tank underneath the insulation. When the temperature meaured at the panel is higher than that measured at the tank – power is provided at the output which can be used to directly power a small (i.e. sub 3 Amp) 12V solar water heating pump, or to trigger a 12V relay connected to a mains-powered pump or large 12V pump and suitable power source. If this controller is to be connected to a relay-triggered mains-powered pump, great care needs to be taken to ensure that all high voltage connections are made securely, that they are well insulated, and that the pump is correctly earthed. We recommend that you employ the services of a qualified electrician. NEW Click here for details of our new microprocessor-controlled Solar Pump Controller with Relay – an enhanced version of this circuit with a fitted 12V rated 10 Amp relay. Click here to view the connection diagram for the REUK solar pump controller. If you would like to save some money and build this solar pump controller yourself, we can supply the necessary electronic components if required – LM335Z temperature sensors, the power MOSFET, resistors, capacitors, connectors, connecting leads, and the LM393 comparator chip. Contact neil@reuk.co.uk for further details and pricing.